This post out of order but it is part of the process so I am going to insert it here and give you fair warning. The first time I talked to Aidan about this game, I dawned on me that we have a real problem with two players. Players are going to know, just by looking at the open contracts, who is the owner of which contract. The other major problem we had at the time was how we were going to handle the agent side of the bidding process. The entire time I was thinking that one player would be working on one job. It never occurred to me to have all the players in the game have agents working the same job. I was thinking about how to get a contract owner to accept specific agents without giving up their identity. This was a major issue because the whole idea of the game is to not know who you are working for. I honestly thought the game was dead. At the time these issues came up. I was a few days away from figuring out the solutions. 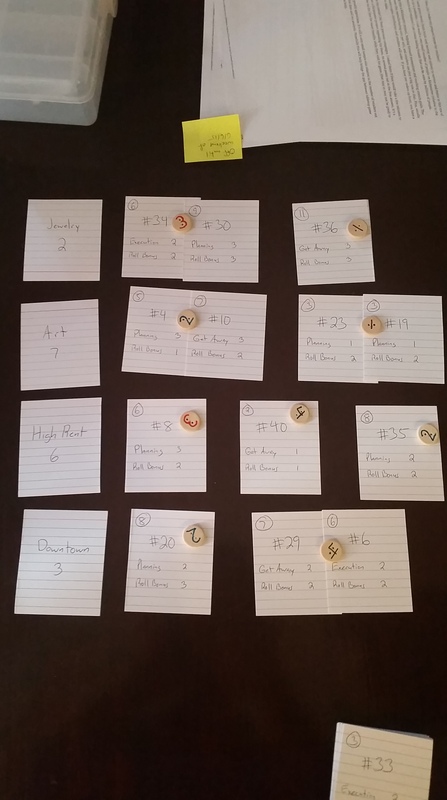 The two player problem is currently solved with a couple random cards drawn from a dummy hand. The agent problem, as you have seen in a previous post, has been solved with the use of player specific tokens and allowing all agents supplied to a job to participate in the job. What I would like you to take from this is that I really thought these were game breaking problems when they came up. I was not sure we could come up with a two player variant, nor did I think the agent bidding problem could be solved without changing the entire concept of the game. Yet, the solution to both of these problems is as easy as a couple more cards to throw people off each other’s tracks and a simple token for each player. There might be some major issues that come up during and after testing, but there are solutions out there to the problems we face in our games and the willingness to look for and find them can solve most of the problems out design will face. Today we will give you the details on the agents. Currently there are 48 agents in the game. Agents are used to pass skill checks for contracts and act as a way to boost die rolls. Each agent has one of three skills. Those skills are Planning, Execution and Get Away. They also have a roll effect. 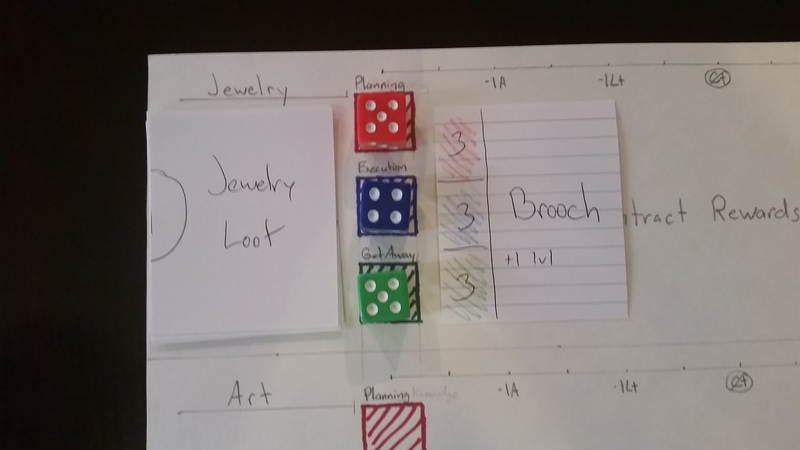 Roll effects are used whenever a player rolls a die and they want to boost a poor roll. In the top left corner, each agent has a cost. The cost of each agent is the amount of money a player will receive when one of their agents is used in a mission/contract and they are successful. Agents are used to pass skill checks and in the example above, you can see that the base level skill checks for this region are 5 Planning, 4 Execution and 5 Get Away. 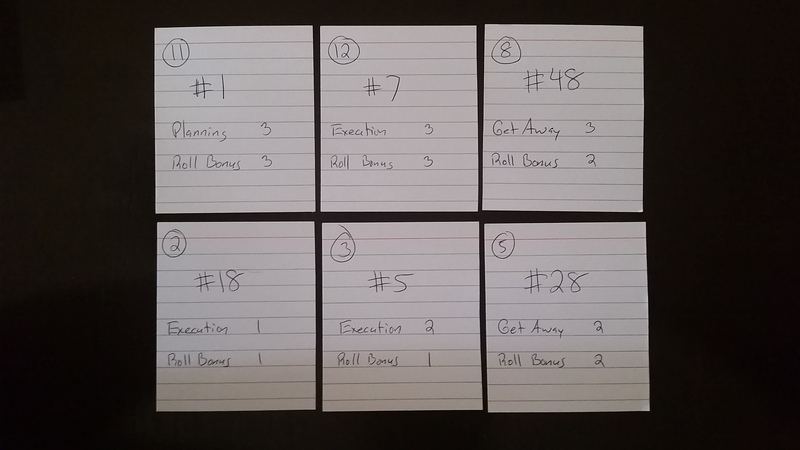 Add to the base level the checks required for the card and you end up with a total skill required of 8 Planning, 7 Execution and 8 Get Away. Let’s assume these are the agents that have been accepted by the contract owner and they are about to attempt the mission. Each agent will roll a die, add their skill, combine that with the roll and skill of any other agents working with them for that particular skill. If this total is larger than the skill check required, the skill check is passed. If all the skill checks are passed and the mission is a success. The six agents on this missions rolled really well and rolled an 18 Planning, 13 Execution and 12 Get Away. The contract owner would reveal who they were to collect the reward and the contract owner would then have to pay all the agents in the mission. In this case, the contract owner would have to pay $40K in agent costs. Some of the agents could have been their own but this was an expensive mission. 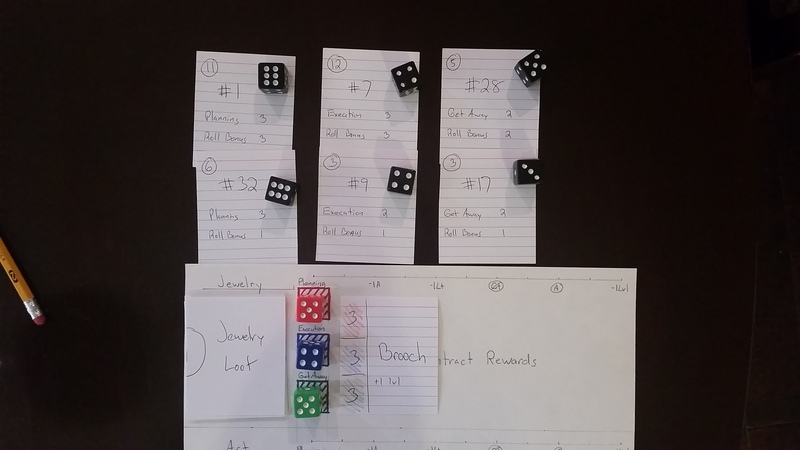 There were a lot of dice rolled and the chances of the mission being successful were high, but that comes at a cost. You can try to use few agents to lower the cost, but risk the mission failing. As always, if you have any questions, feel free to contact me. I know the explanation is fragmented, but I want to divvy out the game in pieces as not to throw out too much at one time and give people a chance to digest the pieces as they are released. Even though there has been a lot of progress on the game, I need to update you on the main mechanic because we made a change to the way it works and I don’t want to cover anything else until you have a chance to see it. For specifics, please see the previous post about the Main Mechanic since I don’t plan to cover the main mechanic in great detail in this post. Players will also have a set of contract ID cards. 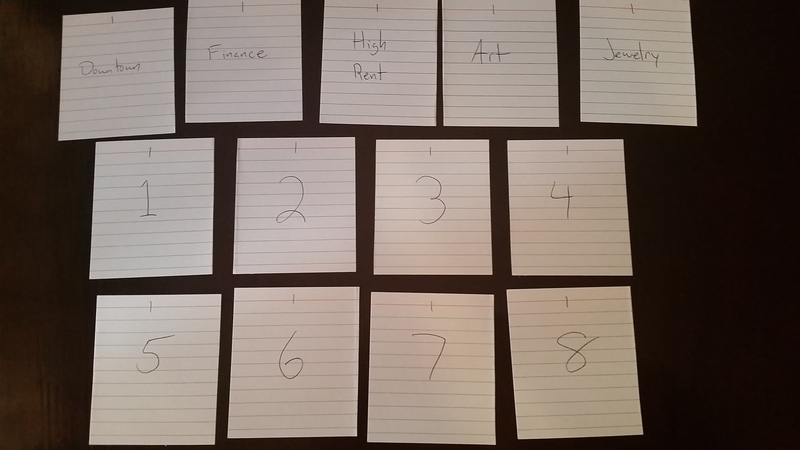 Above are the contract ID cards which include one card for each region and a set of numbers 1 thru 8. 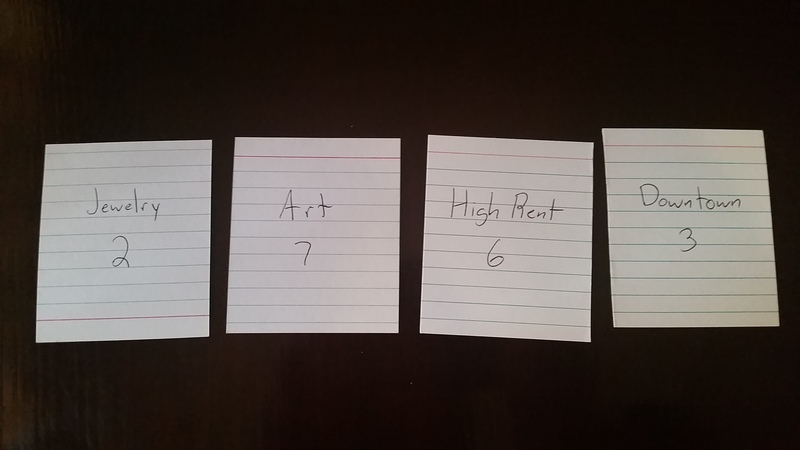 Players will be able to ID the contract(s) they turned in using these cards. Players will now select one of their contracts to give to the collector. They will also set aside, face down, the ID cards that match the contract they turned in. Now that the contracts have been shown to the table. 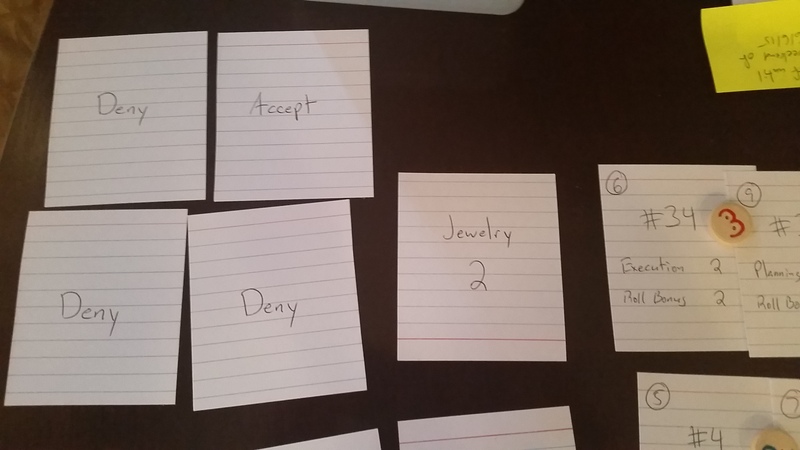 Players will start playing agent cards for the various contracts and accept or deny cards. When players place an agent on a job, they will use a token to ID which agents belong to them. Players can play more than one agent on a job. When a contract has 4 accept/deny cards played on it, the A/D cards are revealed, if there is an accept card, the job is attempted. If all the cards are deny, players take their agents back and the and the A/D cards are held until the end of the round. Prior to this method, we were worried that players might forget what mission was theirs and two players might claim the same contract. 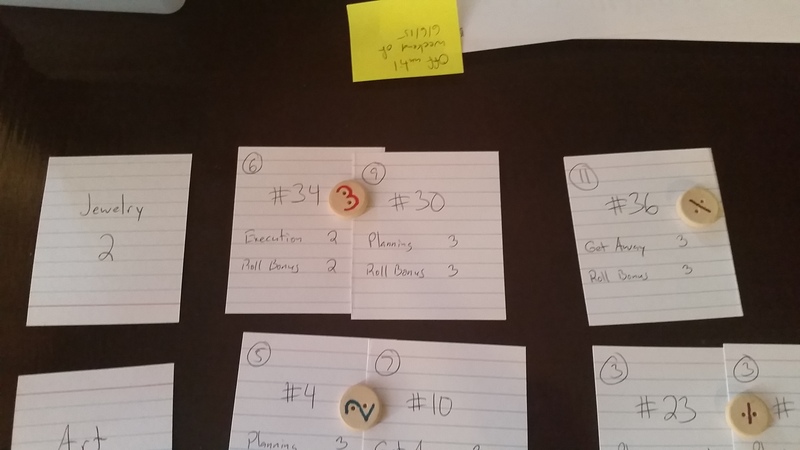 Our plan was to test the game as it was and see if that was really a problem. 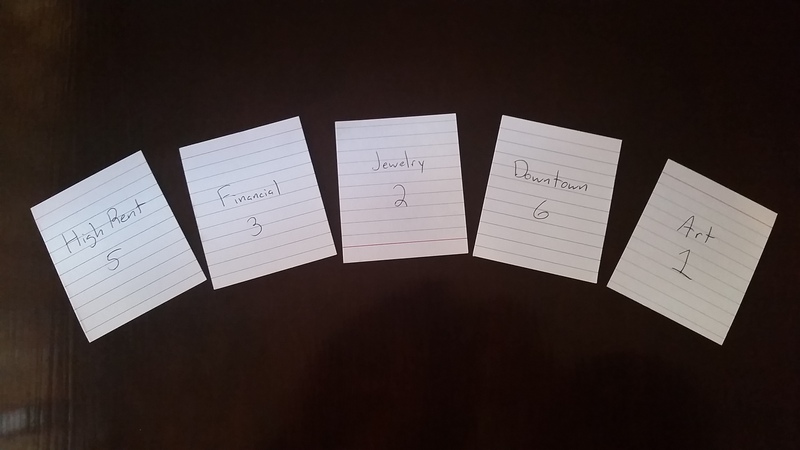 While we were talking about this game this past weekend (6/12) we came up with this solution and I spent the rest of the weekend working on changing the prototype around. There were a few other changes but I will cover that in a later post. As always, feel free to check out our google doc and leave us comments or questions. The best part of being part of a design team is having a co-designer to check in with when you are working on a separate project. I took what I had on my white board and what I had made so far of the alpha prototype and walked Aidan through the game. We focused on the bidding mechanic right away as we both identified the bidding mechanic as the most interesting part of the game. 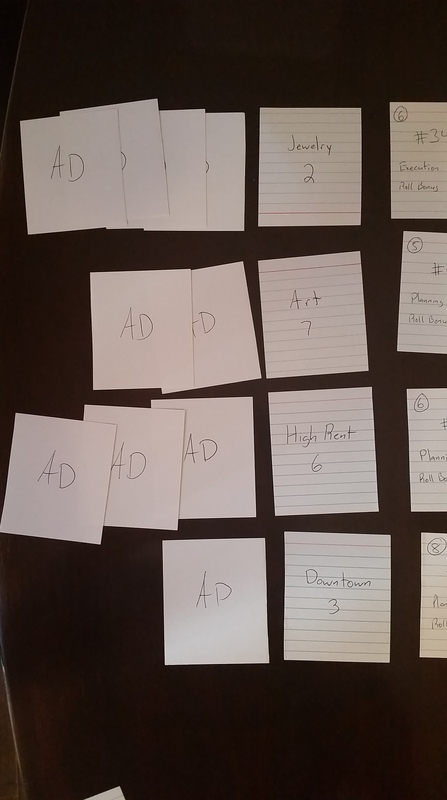 While I was explaining the full game concept, I did mention that the first iteration of the game used a hand of cards moving around the table. I talked about what I liked and didn’t like about the idea of a hand that moves around and while Aidan kind of liked the idea at first. I expressed my list of concerns with a hand of cards that could be dropped of lose its order and we both agreed that we need to find a better way. Keep in mind, the main mechanic I wrote about earlier was not set in stone at this point, we were exploring all of our options. We looked at the idea of having players turn in two cards, one would be the contract and another would be an identifier card. All players would turn in their pair of cards to, what we were calling, a “coat check” player. 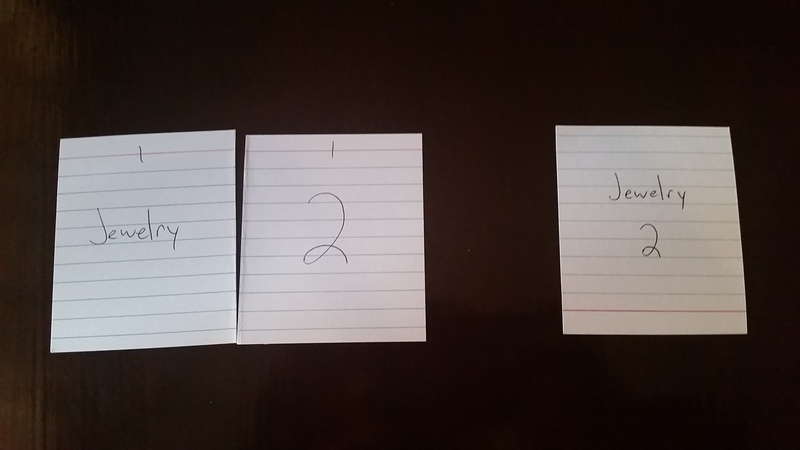 The Coat Check would have to shuffle the pairs of cards and display the cards on the board. We didn’t like this because the cards could easily get mixed up. 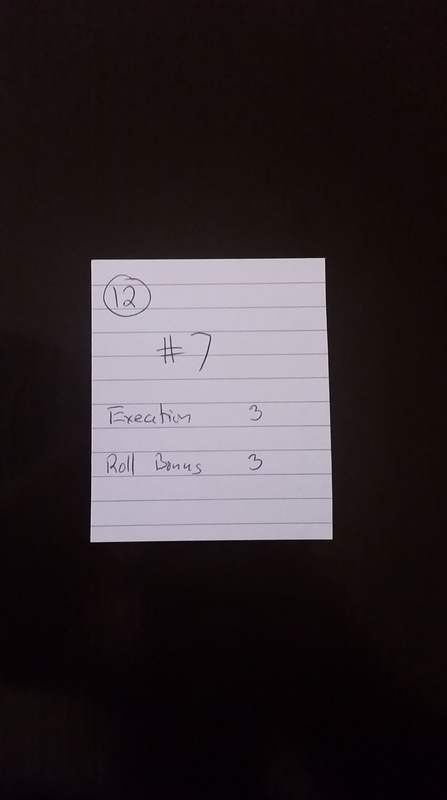 We thought about making the Coat Check a player that would know who turned in what contract. They would not be allowed to bid on that set of contracts and the Coat Check player would have to rotate every turn. I didn’t like this idea because players would have to take turns watching the action and I don’t like it when I have to do that in games, so I will do everything to avoid designing a game that does the same. We talked about using envelopes for players to turn in and having one player open and reveal the contents of these envelopes. While that system could work, I did not like the idea of having a component in the game that could break down over time. Especially with hearing stories of Sheriff of Nottingham bags that are starting to lose their snaps, I wanted to pass on the idea of using envelopes. We continued this back and fourth for at least an hour. What we really liked about the mechanic was the hidden identity and the reveal moments after a job was completed. 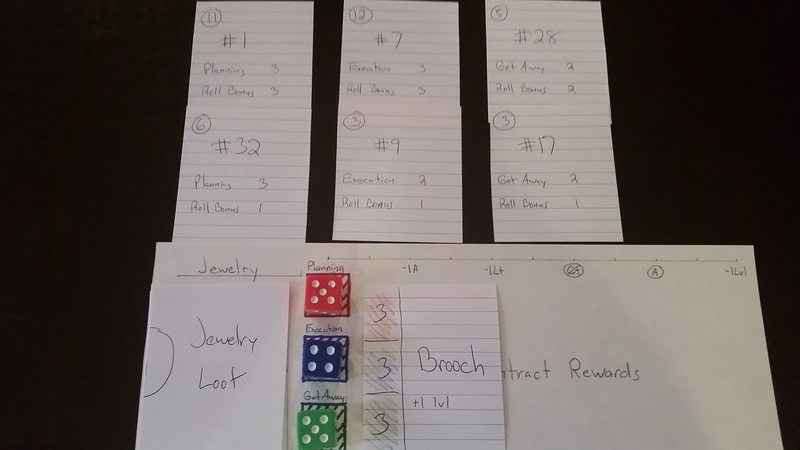 We also decided that the bidding system, as it stood, was good to move on to testing and it would be used to complete the rest of the alpha prototype. The only problem we saw was the chance the a player could mis-identify their contract, but the amount of time from turning in a contract to seeing it back on the board was so short, we are thinking that players will be able to remember. Moving on from the main mechanic, we talked about how we would handle agents. We talked about using a die for each agent and players will be placing agents on contracts and use those die to roll skill checks. What worried me was the idea that the cost of the game could get really high if we have a lot of dice in the box. If we had scale orders, this would be less of a concern but we are two guys in a kitchen so we are ultra aware of component cost. We also talked about adding an authority track to each region of the board. This was really fun because we liked the idea of adding risk to players should they fail a mission. We still need to work out how the authority track will work but we know we want to add the idea. The last big thing we talked about was players motivation about why they wouldn’t always bid on their own contracts. Aidan brought it up and he was right, why wouldn’t a player do that? The best solution I had was the idea to give players tokens for completing other players missions and making the penalty really bad if players attempt their own mission and fail. Thematically speaking, if your own agents fail and get questioned, it is really easy for the authorities to track you down. If agents have no idea who they are really working for, you are safe. That was half of what we talked about and in the interest of space, I will leave the rest to a second post. Thank you for following along and please feel free to check out the Google Doc below.